Rinse rice under cold water until water begins to run clear. Then transfer wet rice to pot. In a mixing bowl, combine coconut milk and vegetable broth. Pour liquid over rice, along with salt, and give a quick mix. Lock lid at cook for 4 minutes at high pressure. Meanwhile, take a few leaves of mint and basil and chop them as finely as you can. Once cook time is complete, allow pressure to release naturally for about 10 minutes, then quick-release any remaining pressure. Then, use a fork to fluff rice. Add herbs to rice and mix well. 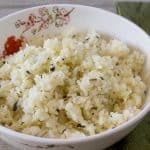 This rice recipe will be both sticky and clumpy, not individual grains - perfect for serving with something with lots of liquid to soak it up.